Aghna means to suffice and to give someone his needs sothat he does not resort to anybody else. Allah is the Great SUFFICER Who suffices His creatures with all their needs and gives them lavishly; He says, “..the bounties of thy Lord are not closed to anyone”(ISRAA’, 20). 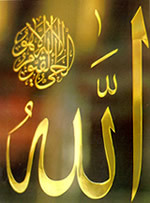 The sense of self-sufficiency is one of the best grants that are bestowed upon the human being; anyone who abstains from what is forbidden is endowed with all the means he needs; anyone who dispenses with everyone is enriched by Allah; anyone who forbears will be granted forbearance and everyone who seeks the righteous way will be perfectly guided thereto. Allah suffices people by making them dispense with everyone saveHim, thereupon, we need no one but Him. Anyone he who is sufficed by the Great SUFFICER, may not be completely self-sufficient as he inevitably needs someone, for instance, to cookhim his food, and another one to treat him when ill; he needs air to breathe, he needs a place to live in, he needs warmth and sympathy, he needs amate, and above all he needs the Great SUFFICER; Glory be to AllahWho enriches and suffices the human being, true is the word of Allah, the Great SUFFICER as He says, “But God is free of all wants, and it is ye that are needy” (MUHAMMAD, 38).